Friendly faces from Sunrise Hoi An Beach Resort greeted us the moment we exited Da Nang airport. 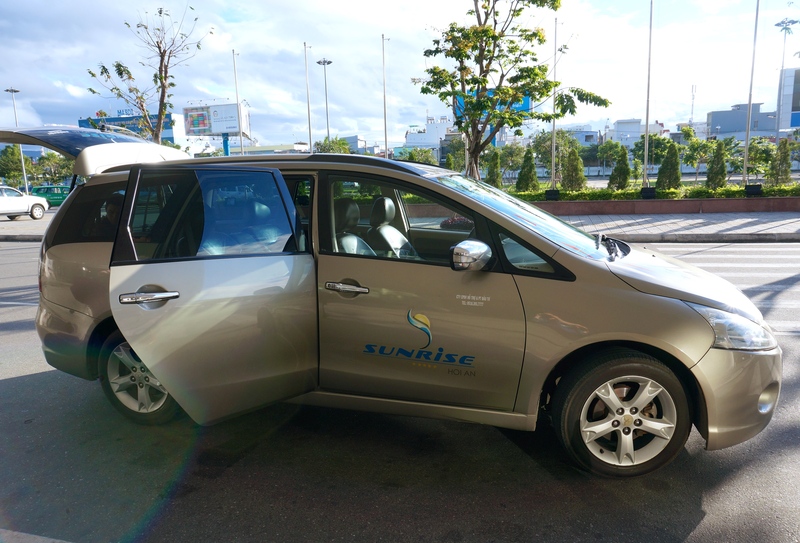 One of Sunrise’s vehicles (with cold bottled water and air conditioning) was there to pick us up for the 35 minute drive to the resort. Our driver was knowledgeable about the local area and answered all of our questions. Upon arrival at Sunrise, several staff were on hand to welcome us and ensure our luggage made it safely to our room. Check-in staff were friendly and efficient, and gave us an overview of the hotel services and facilities. We were advised that our room was not quite ready due to our early arrival (9:00 AM) and that we could enjoy breakfast at Sensations Restaurant while we waited (more on the food below), so off to breakfast we went with welcome drinks in hand. We’ve stayed at several resorts in the Caribbean and without a doubt, this property matches or tops them in the rooms category. 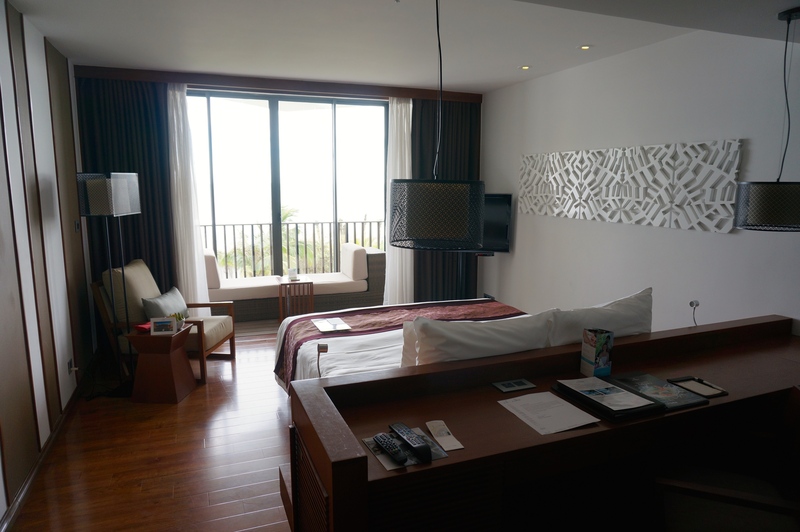 Our room was modern and well appointed with a fantastic sunroom with sliding patio doors that opened completely in the front allowing the breeze off the sea to enter your room. The bed was a cushy king-size, yet had the perfect amount of SE Asia firmness (hotel beds in SE Asia tend to be a little on the firm side) to allow for a perfect night sleep. The room was immaculately clean. 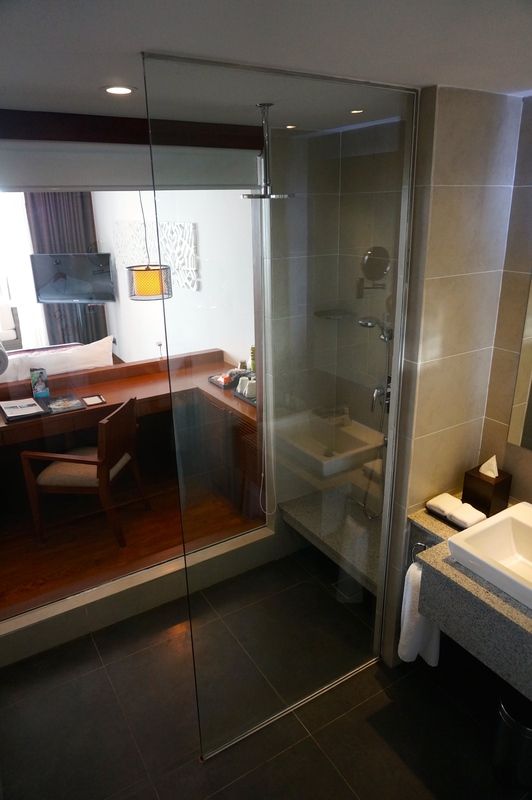 The ultra-modern shower with both a hose and rainfall shower head, with plenty of room for my 6’2” frame, was a welcomed treat after an unusually cool day exploring Hoi An. Lots of water pressure and don’t worry about running out of hot water. We were especially impressed by the layout of the room as every aspect is designed so that you can enjoy a sea view no matter what you are doing. The shower wall is floor to ceiling glass (retractable curtain) so you can actually stare at the sea while you are showering. The office/desk and bed are also sea-facing for so that you can always keep an eye on the sea. The WiFi was perfect for surfing the internet and checking email, although it was a little on the slow side. Management had left a note in our room stating that they were working to correct a recent issue with the WiFi and apologized for any inconvenience. As we spent the majority of our time in Hoi An trying the local Vietnamese cuisine, we only ate breakfast at Sunrise and it was top-notch. 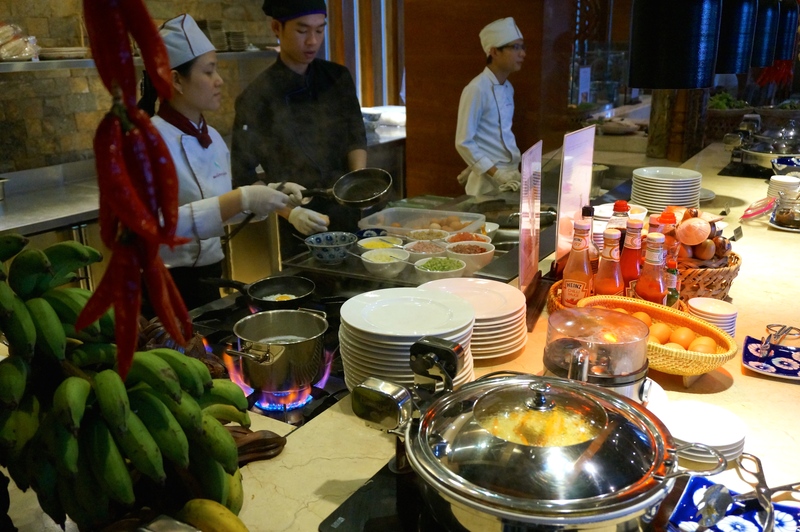 Similar to your typical all-inclusive resort, you have your made-to-order egg station serving everything from custom omelette’s, poached, fried and boiled eggs. There is plenty of crispy bacon, grilled sausages, fried potatoes, cereals, yoghurt, fresh fruit and more. Bonus points for Nutella and peanut butter near the bread station. We enjoyed an americano and cappuccino with our breakfast every morning, but there is also filtered coffee available. There is a full menu for room service available in-room, as well as stocked mini-bar with beer, pop, juice, and chocolate bars. Bottled water is complimentary and the hotel advises not to drink tap water. However, I brushed my teeth using the tap water and was perfectly fine. 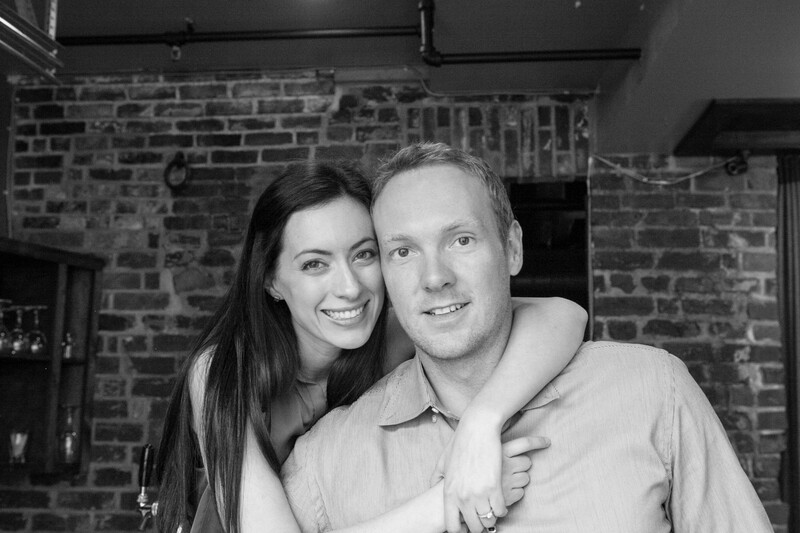 Other dining options include Sao Bien, Sunrise Beach Bar, and the Givral Lobby bar. 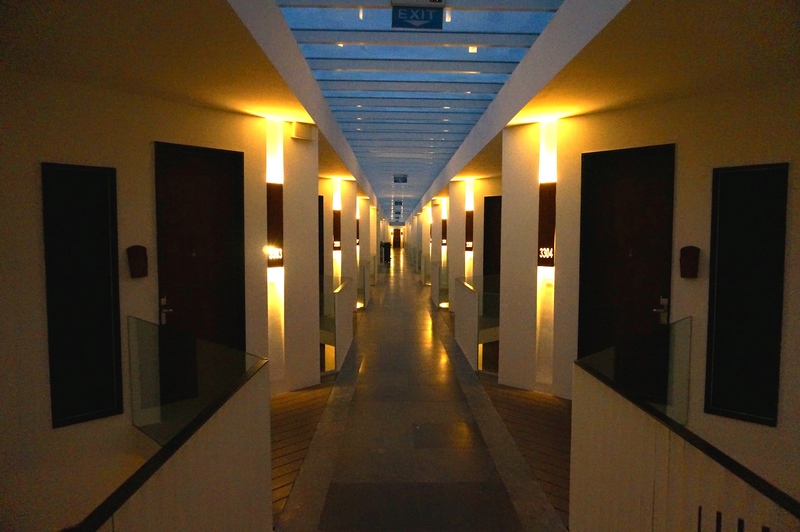 The resort is a short drive to the centre of Hoi An, and a shuttle service is offered which runs regularly throughout the day, for both drop off and pick up. Sign up in advance to secure a spot – our visit was in between high and low season, so we had no trouble finding space on the bus, even with short notice. 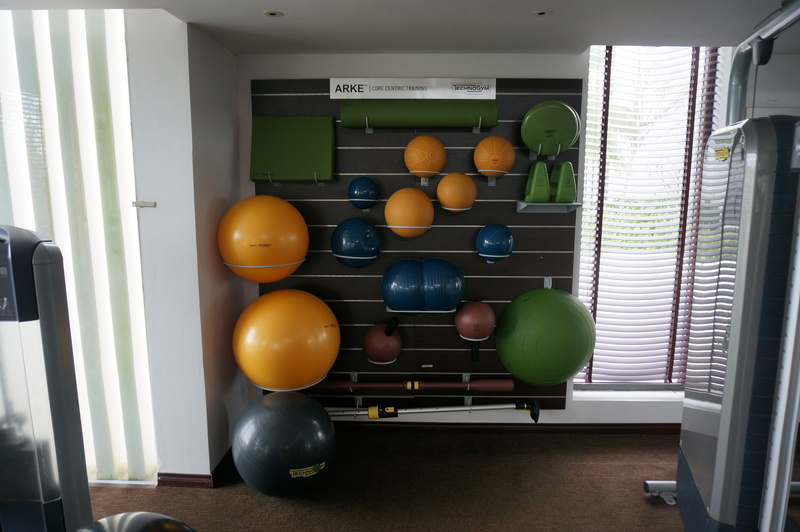 Far more than your typical ‘hotel’ gym, the gym at Sunrise offers a great mix of free weights, cardio machines and has an awesome core training centre as well. 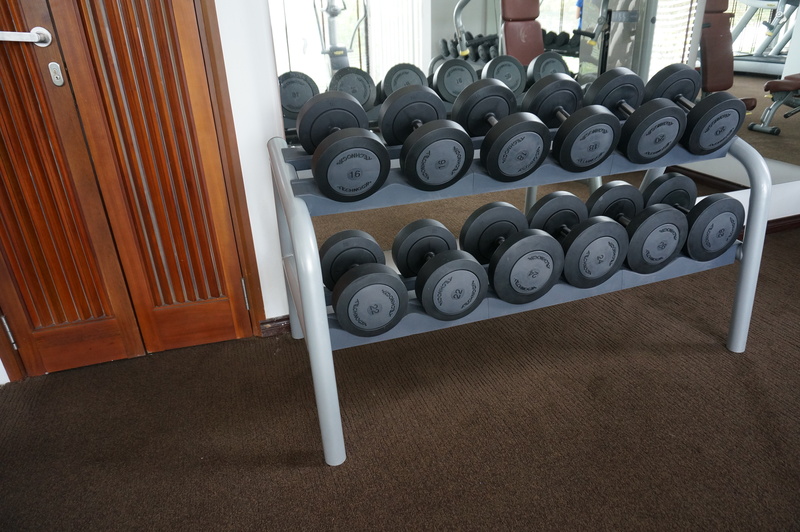 Plus, we had the gym to ourselves. 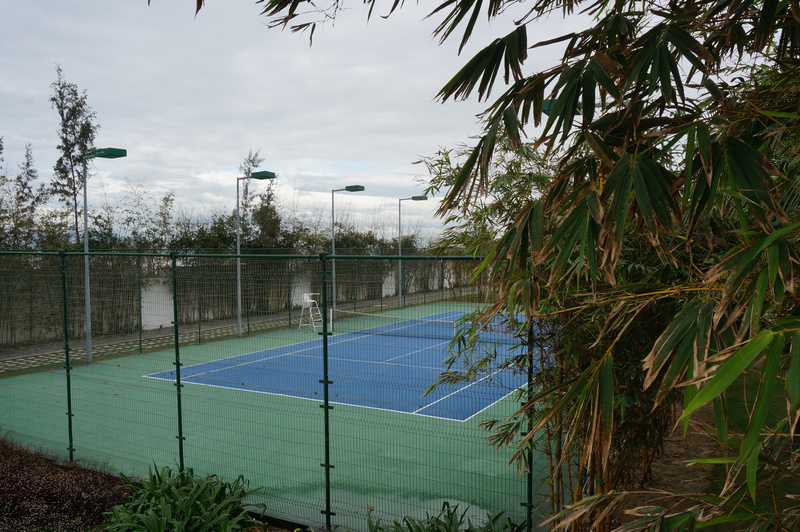 There are tennis courts on site as well for those looking for some physical activity. There are two large pools. One large pool that serves as the focal point of the property. You cannot miss it when you walk out of the reception area. 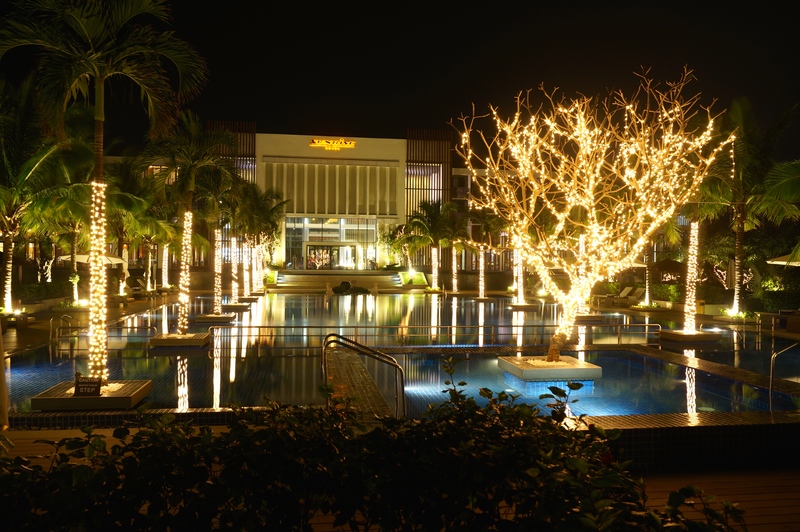 The pool is spectacularly lit at night offering an awesome place to sit and relax and enjoy a cocktail. Another pool, a lap pool, lies perpendicular to the sea. A great place to get your early morning, or late evening laps in! At the time of our visit (January), the sea was quite rough and you could almost feel the spray when standing near the end of the pool. During our stay, we did not venture into the pools. Apparently our bodies have adjusted to temperatures in the tropics and found the 20-22 C temperatures to be quite cool, and they are for Vietnam! We thought this was important to note, as currently there is no beach accessible directly from the resort. In 2013, the resort’s beach was damaged by a typhoon and they are still working to repair the damage. There is a man-made sandy area with lounge chairs available, where you get a good view of the sea, but there is no access to the water from the resort. We didn’t get a chance to visit the spa, but if a massage is what you are looking for than you can look no further than Sunrise’s Bodyworks Spa. Bodyworks offers everything from the Signature Sunrise Hoi An Massage to a detoxifying facial with green tea mask. Overall, we were extremely pleased with Sunrise Hoi An and everything it had to offer, despite the weather not cooperating during our stay. 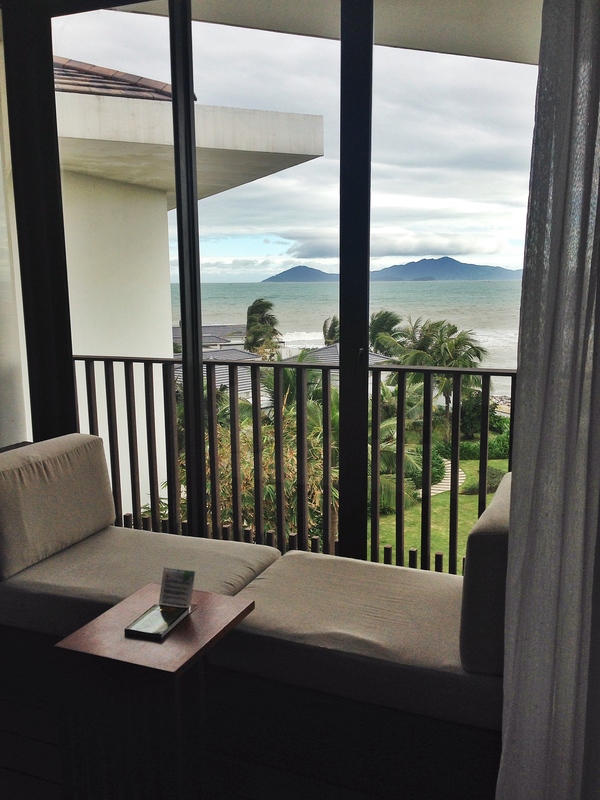 Most memorable was our room with its ocean view and sunroom. It was the perfect setting for reading, sipping on a beer and watching and listening to the choppy waters crash on the shore. 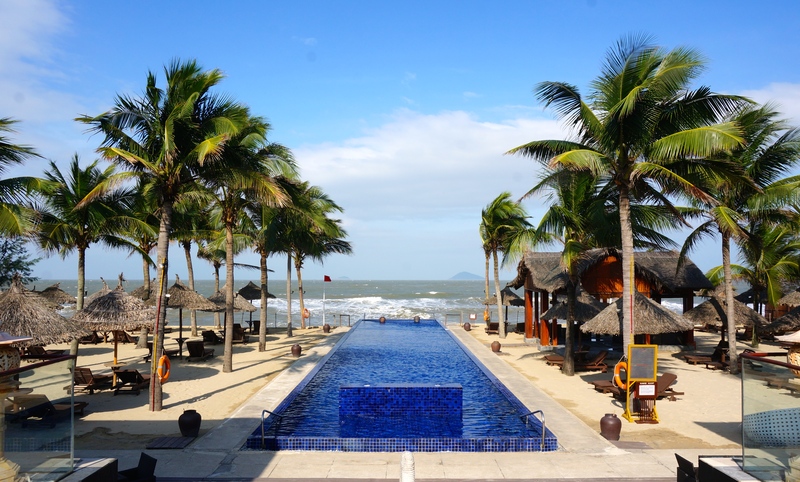 If you are planning a trip to Hoi An, make sure you include Sunrise Hoi An Beach Resort in your plans. We were happy we did! 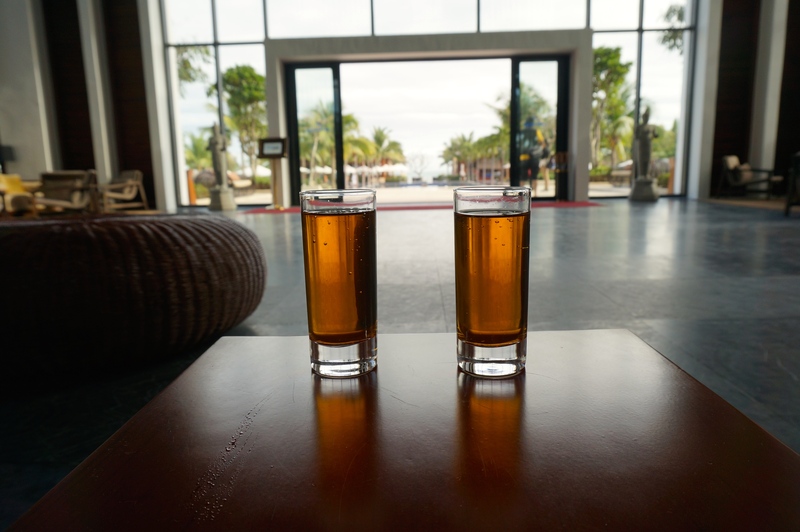 Finelinetravels was a guest of Sunrise Hoi An Resort, however, as always, the views and opinions expressed herein, are those of finelinetravels only.